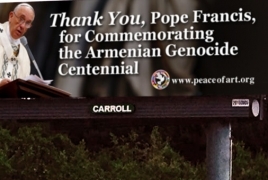 PanARMENIAN.Net - Peace of Art, Inc. is completing its Armenian Genocide Awareness Billboard Campaign, “100 Billboards for 100 Years of Genocide,” with one more billboard in Sharon, Mass., displaying displays a message of gratitude, and reads, “Thank You, Pope Francis, for Commemorating the Armenian Genocide Centennial,” the Armenian Weekly reports. In April 2015, at St. Peter’s Basilica, Pope Francis called the Armenian Genocide “the first genocide of the 20th century.” The event was unprecedented because, for the first time in history, the Pope mentioned the Armenian Genocide in his liturgy. In January 2015, Peace of Art, Inc. launched the Armenian Genocide Awareness Billboard Campaign. Throughout the United States and Canada, Peace of Art, Inc. has displayed large electronic and stationary billboards dedicated to the Centennial of the Armenian Genocide, and in honor of the victims of all genocides of the last 100 years.